strict warning: Declaration of views_handler_sort::options_validate() should be compatible with views_handler::options_validate($form, &$form_state) in /var/www/d6.yin80.com/htdocs/sites/all/modules/views/handlers/views_handler_sort.inc on line 165.
strict warning: Declaration of views_handler_sort::options_submit() should be compatible with views_handler::options_submit($form, &$form_state) in /var/www/d6.yin80.com/htdocs/sites/all/modules/views/handlers/views_handler_sort.inc on line 165.
strict warning: Declaration of views_handler_sort::query() should be compatible with views_handler::query($group_by = false) in /var/www/d6.yin80.com/htdocs/sites/all/modules/views/handlers/views_handler_sort.inc on line 165. Check out our Special Discounts! Take advantage of our specials by sending 20 units you will get 1 free. * Price with out model, Add $28 for SLA model or $20 for stone model. CEREC inLab restoration choices create a path to excellence for any clinical indication-choices that concur both esthetically and clinically with the case at hand, as well as with your standard technique. CEREC inLab technology will expand the efficiency and profitability of your dental practice, offering your patients the benefits of all ceramic restorations while maintaining the same prep and placement you already use. With faster lab turnaround times and the superior fit of a computer assisted design, there is no question as to why digital dentistry is better. Inlays and Onlays are great aesthetic alternative to traditional silver fillings. With innovative materials we create custom inlays and onlays from composite, porcelain, and milled technologies. Our inlays and onlays are designed for exceptional fit, and natural beauty to blend flawlessly into your patient's smile. With Nobel Biocare’s custom titanium and zirconia abutment system, we will scan you’re your implant abutments in our dental lab, giving you and your patient the perfection they expect. Our 3-D image scanning software combined with our dental expertise delivers strong abutments with superior quality and fit. The Nobel Biocare’s abutment system will open a new world of efficiency and profitability for your dental office and is ideal for your choice of custom Zirconia or Titanium Abutments. A diagnostic wax up is a powerful patient communication tool that can visually demonstrate the end cosmetic result. The shape and treatment expectations of the teeth are easily discussed with the patient, and can dramatically increase treatment acceptance rates. Diagnostic wax ups are not just for the patient, however, and can be used as a visual aid for adequate tooth preparation and a quick and easy template for beautiful final restorations, assuring you and your patient predictable results every time. 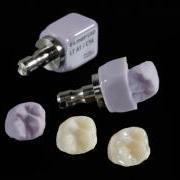 Wish your dental lab received only picture-perfect impressions for the creation of beautiful cosmetic restorations? Well, lab technician, Eddie Corrales, has made that wish closer than you think. In order to use the Remote Lab service you will need to set up a account at logmein.com. Below are the instructions for getting started. Please feel free to contact us if you have any questions regarding this process. Zirconia is another name for zirconium dioxide (ZrO2), an oxide of the metal zirconium. Zirconia copings and frameworks with there high flexural strength between 900-1200 Mpa, are an excellent choice for posterior crowns and three-unit posterior bridges. Known for its strength and ability to block out metal posts, our zirconia copings and frameworks are an esthetic alternative to the traditional PFM. With in-house milling and state-of-the-art ceramic materials, our zirconia substructures are built for everlasting beauty.